Chris Reynolds: "I'm going to fight for as long as it takes." 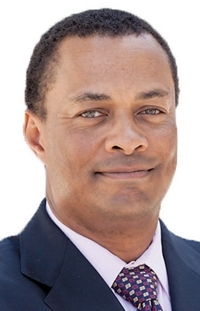 Title: Chief legal officer, Toyota Motor North America; general counsel, Toyota Motor Sales U.S.A.
LOS ANGELES -- Chris Reynolds, Toyota Motor North America's chief legal officer and Toyota Motor Sales U.S.A.'s general counsel, not only has gasoline in his veins, he comes with Motor City blood. His father worked on the line at Ford's Rouge assembly plant in Dearborn, Mich., and the family lived in Detroit. Today, Reynolds is Toyota's top lawyer, defending the automaker against a flurry of potentially devastating lawsuits that accuse Toyota of building cars that suddenly accelerate out of control. To Reynolds, 49, there is no arguing with scientific fact. Toyota's cars were safe then, are safe now and will be safe when the lawsuits conclude, he maintains. He is not a settle-out-of-court guy. "I'm going to fight for as long as it takes to defend the quality, durability, reliability, safety and integrity of this company's products," Reynolds said in a recent interview. "You ask me for a line in the sand, that's it. Whatever we need to do to make sure that, in the minds of our customers, they've made the right decision in buying a Toyota, Lexus or Scion, we're going to do that." As a child on family trips, Reynolds spent his hours in the back seat identifying passing cars down to their engine sizes and trim levels. "I am proud that I grew up in northwest Detroit. I did not grow up wealthy, but I grew up blessed," Reynolds said. His love of cars continues today. Reynolds spends a rare free Saturday afternoon poring over Hemmings Motor News, seeking listings for his two dream cars: a mid-2000s Maserati Spyder Cambiocorsa or a match for his family's 1979 Mercedes-Benz 450SLC in forest mist green with a beige leather interior. After earning an undergrad degree in political science with honors from Kalamazoo College, Reynolds received his law degree from Harvard University in 1986. After passing the bar, Reynolds clerked for prominent Detroit Judge Damon Keith of the 6th U.S. Circuit Court of Appeals. He then flipped between working for two top Eastern law firms and for the U.S. Attorney's Office for the Southern District of New York before becoming Toyota's general counsel in 2007. At both law firms, he made an impact. Ted Mayer, managing partner of Hughes Hubbard & Reed in New York, calls Reynolds "the complete package of someone who was supersmart, superpersonable and very good on his feet. Even then, he had the makings of a complete litigator and business lawyer." Francis Milone, chairman of Morgan, Lewis & Bockius in New York, said Reynolds was "a trusted adviser" and "a masterful courtroom advocate." In the mid-2000s, Reynolds worked for the firm that did occasional legal consulting for Crain Communications Inc., owner of Automotive News. Reynolds' promotion to chief legal officer of Toyota Motor North America marked the first time the automaker had such a position. He oversees 42 legal professionals in areas such as product liability, advertising compliance, antitrust, business litigation, business transactions, dealer relations, environmental litigation, intellectual property and strategic initiatives. In addition, Reynolds oversees the groups that handle corporate responsibility, including privacy, internal audit, risk management, environmental audit and environmental health and safety programs. Confident but modest, Reynolds is praised by peers and colleagues not only for his legal mind but for his skill as a manager and delegator. When the unintended acceleration lawsuits were filed, Reynolds made the controversial decision -- in legal circles -- of choosing out-of-town law firms to represent the automaker. While Toyota's traditional L.A. law firm of Gibson, Dunn & Crutcher will be local counsel, the heavy lifting will be done by Bowman and Brooke of Minneapolis as well as Atlanta-based Alston + Bird's Los Angeles office. Toyota will admit only that a beauty contest took place among vying firms, but legal analysts told the Daily Journal trade magazine that Toyota likely rated other factors, as well as competitive billing rates, as more important than location. Despite Reynolds' desire for Toyota's vindication, most class-action suits settle out of court, when legal impasses and wrangling threaten to drag matters out too long for one or both sides. It is doubtful Reynolds will blink first. "Of course the plaintiffs believe passionately in their case," he said. "I look at whether we have the necessary facts and resources and legal arguments to defend the company effectively. If yes, then I do not worry about how big the case is or how hard the plaintiff pounds the table."